ONTARIO – Noront Resources of Toronto and the Marten Falls First Nation (MFFN) have signed an exploration and project advancement agreement. 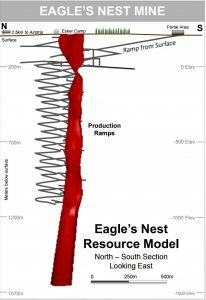 Resource model for the Eagles Nest nickel-copper mine. The terms of the deal call for compensating MFFN for work that has been completed on their traditional land and outlines a one-year process that will be used to negotiate a predevelopment agreement for the Eagles Nest nickel-copper-platinum-palladium mine located in the Ring of Fire. As part of the agreement, and by fulfilling certain obligations and arrangements, MFFN becomes a shareholder of Noront Resources. The company has agreed to issue 311,111 shares of Noront stock valued at $0.225, the closing price on April 12, 2017, subject to approval by the TSX venture exchange. The Eagles Nest deposit has proven and probable resources of 11.1 million tonnes at 1.68% nickel, 0.87% copper, 0.89 g/t platinum, and 3.09 g/t palladium as well as inferred resources of 9.0 million tonnes at 1.10% nickel, 1.14% Cu, 1.16 g/t platinum, and 3.49 g/t palladium. Noront is proposing a project that will produce 234.2 million lb. of nickel and 19.2 million lb. of copper annually. More information is available at www.NorontResources.com.